Order before 4/29/2019 to get a FREE upgrade to our Access 2010 version! 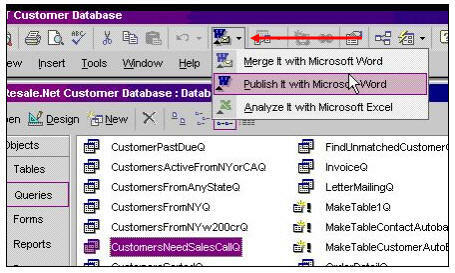 Access 308 continues our advanced Access database development with VBA programming. This class focuses on importing and exporting data. We'll learn about the different types of importing and exporting, and what it's used for. You will see how to export tables to another Access database, how to export query data to Microsoft Excel, and how to use the OfficeLink button to export data to both Excel and Word. We don't stop there. That's just the easy stuff. Next, we'll learn about comma delimited and fixed-width text files. How to create an import/export specification; how to create a macro to export text automatically using the TransferText action. We'll then learn about a similar TransferSpreadsheet macro action. You will then learn how to import data from another Access database; how to append imported records to an existing table; how to link to tables in another database; how to link to an existing Excel spreadsheet; how to link to a Named Range in Excel; and how to link to a text file. Finally, I'll show you a neat trick - how to take a name like "Joe Smith" and split it into two fields "Joe" and "Smith." Shirley on 4/24/2008: Export to a user-specified location: Access 308 is a great tutorial for automating the export of data to a txt or alternate file, however, it only provides the ability to export to a statically specified file. Is there a way to have Access export to a location that is specified on a field on another form. I have been playing around with this, both in vba and macros and can't get it to work. For example, if the form that also contains the button for executing the macro or vba code also had an unbound field that the user could specify the location and file name to export to, I would like to reference that field as the file location. I have tired just about every syntax I can think of and can't get it to work. This would allow the user to save the file in any location or file name. Also, by doing this, I could set it up so that the user could use the file browser to specify the location. Thanks for your advice and I love your tutorials. Richard Rost on 4/24/2008: Shirley, EXCELLENT question. Yes, it is possible to have the user specify the filename for the export. There are two EASY ways to do it. The first is to simply place a textbox on the form where your export button is, and have the filename in that. We learned about this technique in Access 202, lesson 2, where we shared values between two forms. You can use this same notation in macros, queries, VBA code, etc. And that would prompt the user for the filename, giving them a default vallue of C:\ExportFile.xls. We learned about InputBox in Access 306. There is another way you could do it... but that would involve introducing the FILE and FOLDER controls to your database. I personally don't like pulling in extra controls into my database unless absolutely necessary, but Microsoft does make nice controls that you can browse for files and folders with. I cover them in my Visual Basic 106 class, and the same controls work in Access too. You're still going to have to refer to the filename you select in your macro though - so you'll still need the Forms!FormName!Field notation. Richard Rost on 1/21/2009: Ibad, you need to link the child and master properties correctly in the subform, and everything should work automatically. I cover this in Access 202. I just ordered Access 3008 course. I really need workbook for this class. Please let me know why don't I see this book in your file. Richard Rost on 4/1/2009: Marina, I don't have handbooks available for ALL of my classes. It's based mostly on demand. If I don't sell a lot of handbooks for Access 307, I won't bother writing one for 308. If anyone else is interested in an Access 308 handbook, please post a note here and I'll consider it. Thanks. There are a couple of methods you could use. How are your VBA skills? strPath="C:\Path to the PDF document"
You could replace strPath with a Field on your Form, it would have to contain the full path though. To be on the safe side I've added Chr(34) (which is "- double quotes) around the file name in case there are spaces in folder names, this causes issues and the Shell will stop at a space so won't find that full destination. Panagiotis Zikos on 12/16/2012: Hi Richard. I have found your free lessonsn and tips and ticjs very helpfoyll for me. I am a doctor and I have costructed a data base fos the exams of my patients. I would like to reverse the columns wand row so to have in the first row left the names of each exam and the results in vertical orientation havig as a column header the dates of exms done. Thank you in advance. This is surprisingly not that easy to do in Access. In Excel you can flip the axes easily with one click, but Access is really designed so that RECORDS go across in ROWS and FIELDS go down in COLUMNS. You could make a custom REPORT to display records this way using columns (like mailing labels), but it's not something that Access can do by itself. Panagiotis ZIkos on 12/18/2012: Thank you for your immediate response. I also was exciting for the fact that access cann't do it. I didn't know it. I don't remember very well but I think that a programmer who hadndesigned an database for us in the past, had made it. There's was a table with five fields. Examid, exam set, examshow ( yes/no), and exam name. I could never found the way this table works. Any way thank you. Yes, it's possible to load an Excel file using VBA. I don't have the code handy, but I'm sure you can find it easily with a Google search. I've never seen that happen before. Sure, you have to close and re-run the query after importing new data, but you shouldn't have to rebuild the query from scratch. I'd need to see your database to tell you for sure what's going on. Randy Timmerman on 3/2/2013: I will mess with it some more before I waste your time. If it doesn't work I will get with you. Randy T on 3/3/2013: I tried different things and can't get it to work. Do you mind to look at my database? If so how do you want it sent. You can send me your database and I'll look at it when I get a few minutes. Instructions for submitting files are on my TechHelp page. Randy Timmerman on 3/4/2013: Thanks for your help. I figured it out. Sorry for the trouble. It's no trouble at all. That's why we're all here... to help each other. Joni Moore on 8/20/2013: Richard... is there a way in this process to make sure you're not importing duplicate data? There are ways to check for duplicate data. The best way is to INDEX your table based on some field that has to be unique (like an ID or SSN). Richard Lanoue on 2/29/2016: I have a Vb code version I like... 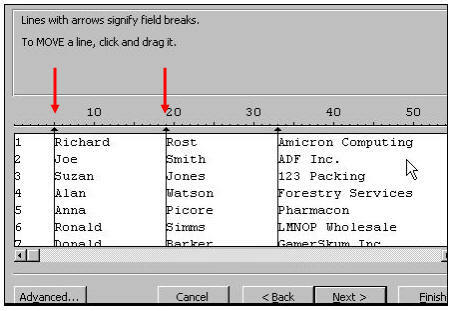 But is there a way to automatically adjust column width, highlight headings and format data in the column (ex. (800)123-4567... I don't want it to be 8001234567 or $100,000,000 NOT 100000000)... Is it possible and if so how?